As technology continues to influence the way we live our lives, certain things we’ve been used to carrying become less essential. Everything is downsizing, allowing us to focus more on style over function, however we still require some focus on function. In the guide we will look at what we think could be the best credit card holder wallet for men. With the emergence of electronic and contact-less payment options, the average person carries less cash than ever before. As such, the need for those old billfold wallets is redundant, and we get to focus on stylish alternatives which complement modern life. The best minimalist wallet should look great but also be practical and robust. As card wallets are fairly simple in design the best focus for their aesthetics is the materials used. Leather is the most traditional material used as it is versatile, durable, and looks great, and there are some great synthetic leathers available too. If you wanted something a little more out there, snakeskin items have always been popular, but in this day and age being animal-friendly is a huge consideration. There are brands creating great wallets from canvas, polyester, and even recycled paper, so if you’re interested in a stylish, unconventional wallet that is Eco-friendly, there are plenty of available options. In our opinion, the simpler the finish, the better, as a minimalist wallet should be reflected in both its use and appearance – over-bearing colors and branding diminishes their elegance. Minimalist in style does not mean inferior in construction. As mentioned, the materials used in the construction of a wallet are widely varied, but all should be properly treated and crafted with attention to quality. Most of these materials are naturally flexible and porous and are therefore versatile but susceptible to damage and decomposing. Tanning leather permanently alters the base material to make it more durable and offer better quality and longevity, while other materials, like paper, should be specially treated or coated to make them more resistant to water and damage. 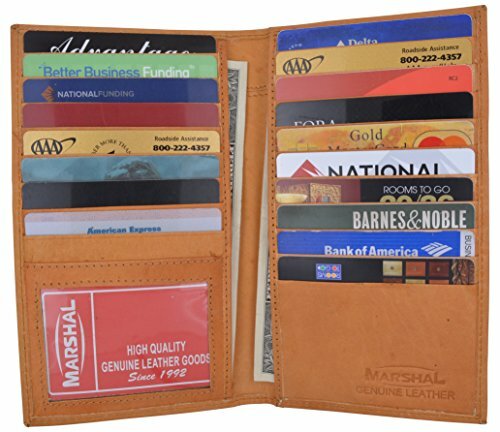 There are other techniques that are important in the construction of a quality wallet, like the folding and layering of the material to form the slots and pockets, as well as the turning over of the edges to avoid fraying, uneven cuts, and add to the strength of the structure. The stitching is also important as any defaults will not only detract from the appearance of the wallet but also compromise the integrity of its construction. 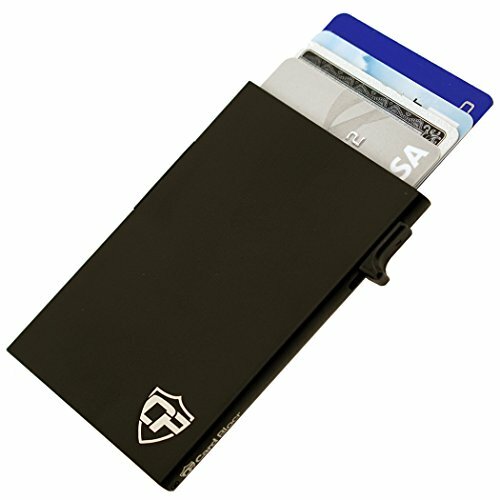 If you’re considering a card wallet then you have most likely decided you don’t need the capacity for dollar bills, change, and other items, or you prefer to keep them separate from your plastic. However, if you still need to establish an adequate capacity to carry the cards and stuff you use regularly, travel document wallet might be an option for you. Some card wallets are designed to carry a few as four cards, and others are designed to carry as many as twelve. Make sure that when you buy your preferred card wallet, it has enough slots for the essential cards you carry daily. It can also be a good idea to have an extra slot or two for if someone hands you an important appointment card or business card. The price of any wallet reflects a number of factors. Popular and designer brands will always come with a higher price-tag as you’re paying for the label as well as the product. The quality of the materials used, the standard and method of craft, and the engineering of the product will also have an impact. Never spend more than you can afford, and make sure you shop around to get the best price! As technology advances, unfortunately as do methods of fraud. With contact-less payment options, criminals can now steal your valuable information and use it, or make fraudulent charges to you without ever physically touching your property, so it is now more important than ever to be vigilant and aware of this kind of activity. To counter such crimes, some wallets have integrated radio-frequency identification (RFID) protection which block certain frequencies and protects your money. If you often travel or have strong concerns about fraud, you might need to consider this technology when purchasing a new trifold wallet. Other novelty features can often be included in the design of some wallets, just make sure they don’t spoil the style. This is an attractive bifold style credit card holder wallet from Marshal, made with genuine leather. This makes a great accessory, and you’ll feel suave and sophisticated carrying this in your pocket. The leather is smooth and luxurious to the touch, and the wallet is fairly flexible before you load it with cards. There are no details or markings on the outer wallet – just the natural finish of the tanned leather, and it comes in three great colors. 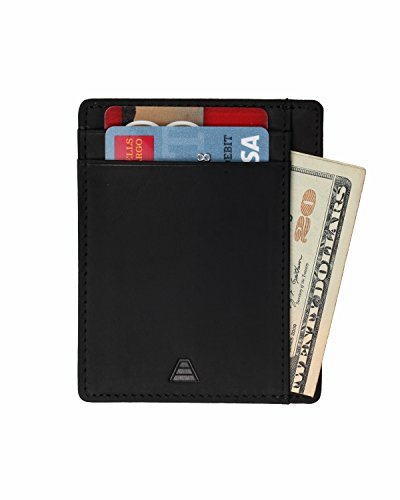 There are 17 card slots altogether, plus a space to keep your ID on view, and both internal and external pockets for bills and receipts, so you have plenty of capacity with this wallet. The wallet comes with inserts to improve its rigidity, but they can be removed if you prefer it to be more pliable. 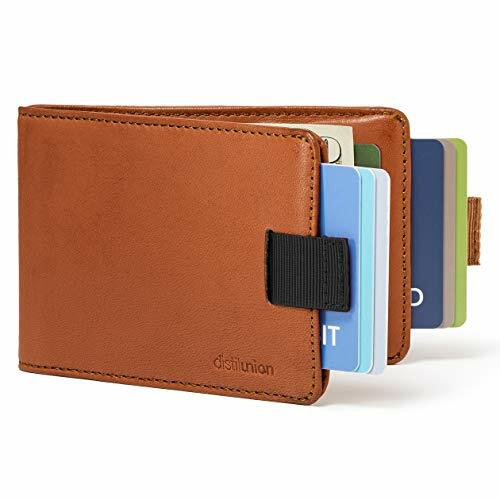 Overall this is a well-designed wallet that is both practical and looks good if you carry plenty of cards this could be the ideal wallet for you, plus it isn’t expensive. Raw have designed this minimalist wallet with both style and function in mind. It’s a simple product that works well, constructed from an elastic and durable material, it stretches to your needs and grips your cards securely. Ultra slim, this wallet is lightweight and will fit discreetly into any pocket easily without spoiling your look. Minimalist in appearance as well as function, the wallet is sleek and stylish in all black, with a subtle logo stitched into the front. Despite its modest size, you can carry up to eight cards, while the specially designed ‘thru-slot’ in the center will safely hold on to a few dollar bills. A small loop on one side allows you to attach a chain or your keys, but we think this wallet looks the best unattached. A modern minimalist wallet which looks understatedly cool, and does what is required with simplicity. If you’re after a cardholder appropriate for every occasion, this might be the ideal choice. At last! A minimalist wallet with room for cash! Only the Raw Wallet has a center "thru-slot" that will hold your currency with an extremely tight grip. Easy to get to, but never slips out. And yes, you can get to it from both the top and bottom. More room in your pockets or your purse, and far less hassle. Never worry about your cards falling out. Its unique material is both stretchy and very strong. You'll love it, or return it for a full refund! Ben Sherman is a designer brand synonymous with creating stylish and quality products and this minimalist card holder wallet doesn’t disappoint. The wallet is slim, lightweight, elegant, and practical, and is suitable to be used casually, or in a formal setting. Made from 100% real leather, the wallet is durable and feels reliable and luxurious. The contrasting colors look great, and the leather is subtly patterned with a gingham print and finished off with a classy foil logo. There is the capacity to carry up to four cards, fewer if you want to place a few dollars in the center pocket, so this is a luxury wallet for just the essentials. 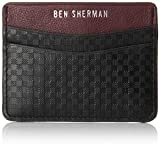 If you carry the bare minimum and have been looking out for a slim wallet that will secure your cards and look great, the Ben Sherman card holder exudes with quality and could be perfect for you. An innovative bi-fold style wallet from Distil Union, constructed with premium quality leather. The materials are soft, luxurious, and are intended to not only last but improve with age as it conforms to your needs. Quality craft and hand rolled edges ensures superior durability and longevity, and a one year warranty is included. The appearance is modern and sleek, and all three of the available colors stand out in a crowd. Innovative design go into making this an extremely practical accessory and the capacity is impressive despite the slim silhouette. A patent-pending FlexLock system pockets keep your cards securely organized, and pull-tabs allow for quick access without stretching the leather. You can carry 12 cards and 30 dollar bills, and the central money clip is adjustable for added security. A beautiful looking wallet which matches a modern appearance with innovative design, this could be a great purchase for someone looking to replace their traditional wallet for everyday use. Every wallet is built to last and comes with a one-year no-hassle warranty. If you are not 100% satisfied, reach out to our customer service and support - we'll do whatever it takes to make it right! Vaultskin has succeeded in redesigning the traditional card holder wallet with the Chelsea . Cleverly designed and constructed from top-grain Italian leather, this wallet looks classic, stylish, and sophisticated. The leather is soft and luxurious and makes for a slim, sturdy piece. It is also extremely practical and user-friendly. Front and back slots allow for up to five cards, while the middle section will comfortably fit five more. The tight leather will stretch with use allowing for a custom fit. The middle section is fully RFID protected, and fitted with a retractable smart strap which allows for quick card access. The Chelsea is slim enough to fit into any pocket and is striking with classic aesthetics and forward thinking structure. If you’re looking for a wallet that looks elegant but is future proof, the Chelsea might be what you’re after. Available in six rich colors. A modern take on wallet accessories, the Lookiss aluminum wallet offers you a minimalist silhouette that offers durability, strength, and robustness. Made from premium aviation standard aluminum, the casing is lightweight, strong, and protects all your cards within. There is enough space for up to 12 cards, but as its solidly build it won’t allow for better storage with use. In additional to the card storage, the wallet is equipped with a money clip on one side. The clip is made of spring steel and will carry a significant amount of cash. Designed to a minimalist specification, the wallet is slim enough to fit in any pocket discreetly. The metal casing also gives you RFID protection. Presented in an attractive gift box this could make a great gift or keepsake. 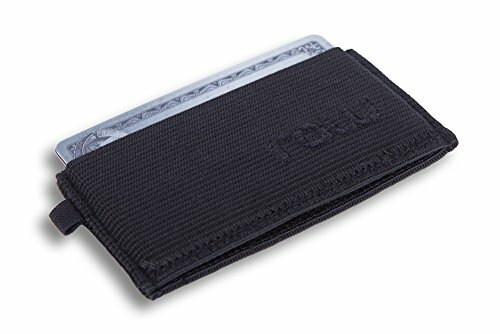 If you’re after a minimalist wallet which has a unique design, but also offers significant capacity, this might be the wallet for you. Thin wallet designed, easy to carry in your front or back pocket. SLIM & ULTRA LIGHT: Significantly thinner than traditional wallets, easily holds maximum 12 cards. Ultra light and slim wallet design makes it suitable and comfortable while carring on. No need to worry about your bloated back pocket anymore with this new released slim card wallet. GIFT BOX PACKAGING: Each wallet has gift box packaging, which is not only a good way to protect your wallet, but also a gift for yourself or someone you love. The ultimate in minimalist design, the Ipulse credit card wallet is slim, small, and lightweight. The wallet looks chic and sophisticated and is built using quality full grain leather. The handcrafted features and details ooze with quality. The leather is smooth and luxurious, yet the wallet feels sturdy and secure. 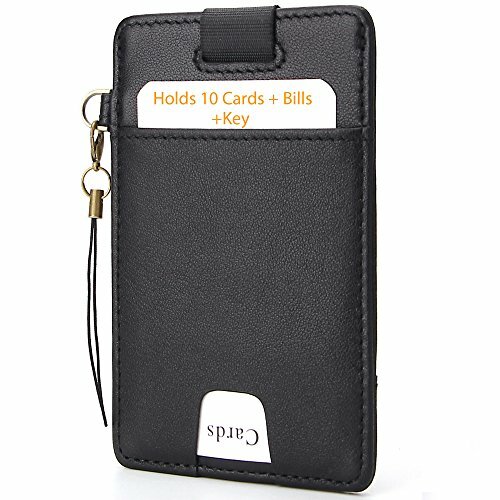 The RFID protected center pocket will hold up to ten cards, they are retrievable by a pull-tab, and the pocket can be secured with a leather strap and clasp. In addition, there is a side pocket, and an elasticated strap with a small slot perfect for holding some cash. All the pockets are tight and secure. A small leather loop on one side allows you to securely attach keys or other valuables. A great looking wallet which could be ideal if you’re looking to swap your traditional one for a minimalist style. Two classic colors available. Smart Pull Tab And Secure Closure : This minimal wallet comes equipped with an pull-tab that provides fast, instant access to all your cards. Grab and pull,choose the cards you want use. There is a closure to ensure your cards stay in the sleeve for good. Worry Free Warranty -- Every wallet is built to last,and comes with a one-year no hassle warranty. Card Blocr by Conceal Plus is a sleek and modern metal minimalist wallet that is convenient and practical. With aesthetics that are elegant and simplistic, this compact, slim design slips into any pocket without spoiling your silhouette. Although it’s not flexible or pliable, the wallet is small enough to carry comfortably in your trousers. The high-grade aluminum is smooth, lightweight, robust, and protects your cards well. RFID protection is integrated into the wallet to protect your sensitive information from fraud. With a maximum capacity of up to six cards, this is the ultimate minimalist wallet. 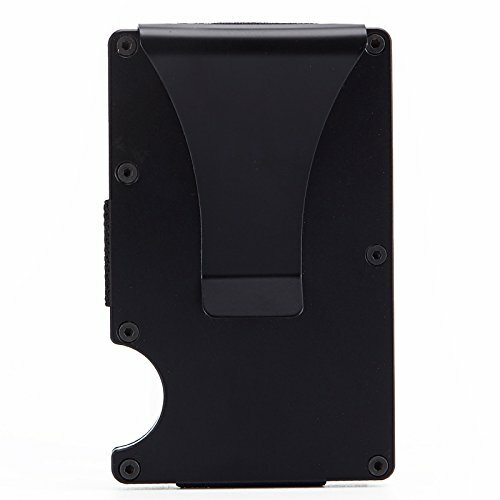 A retractable tray is activated with a slide trigger and makes access to your cards quick and easy. This is a unique minimalist card holder if you’re interested in something robust. If you carry very few cards this could be the ideal wallet for you to downsize to. BEST MINIMALIST WALLET - So slim you almost don't even know it's in your pocket. Card Blocr measures just slightly larger than your cards: 3.75" x 2.75" x 0.33". If you have never tried carrying a minimalist wallet what are you waiting for? CREDIT CARD HOLDER CAPACITY - Card Blocr RFID blocking credit card holders store 4-6 credit cards, bank cards, drivers license, etc. Capacity of 4 for raised embossed cards upto 6 for flat non-embossed cards. RFID BLOCKING FRONT POCKET WALLET - Best RFID credit card holder on the market to protect your identity from RFID scanning thieves and electronic pick pockets. Card Blocr credit card holder is constructed of high grade aluminum and blocks all scanning attempts. 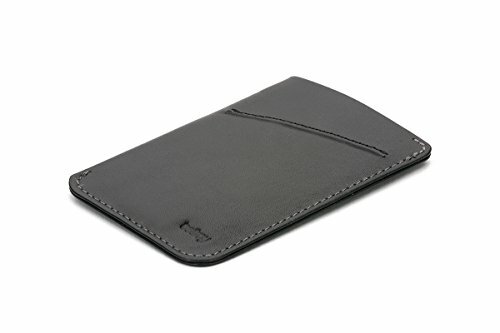 This is a smart looking, efficient minimalist card holder from Andar, made from quality leather. The no-fold design is sleek and elegant, and the slim structure is designed for front pocket carrying. 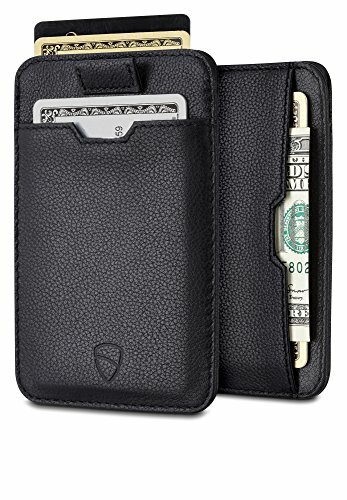 The leather is smooth and luxurious, and the whole wallet feels firm and well crafted, with quality, durable stitching. Available in seven striking colors, the wallet also comes in a stylish gift box. 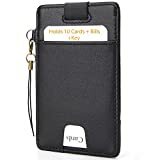 Despite the slim, minimalist silhouette, there are six slim card slots which can carry up to ten cards and a center pocket ideal for storing cash. The lining materials are designed for RFID protection to protect you from fraud. Andar guarantees the high quality of materials used and craftsmanship and as such offer a one year warranty in case of any defective products. This could be the ideal wallet for you if you’re looking to downsize to a minimalist accessory but also want a significant capacity for cards and cash. Best Quality Wallet - The Scout is a functional slim wallet that gives you the best of both worlds, a quality leather card holder and a RFID Blocker. Helping you organize and minimize the way to carry cash and cards while staying protected at the same time. Ultra Slim - Our card case or wallet is perfect hold business cards, credit cards, drivers license, and other identifications. Its compact design can be used for Front or Back Pocket Wear. Quality Leather and Craftsmanship - Crafted with an obsessive attention to detail, our wallets are made from Full Grain Leather. Each wallet is unique to its own and is backed by our one year unconditional warranty. Secure - Andar Wallets are secured with RFID anti-theft blocking materials to prevent you from being a victim of e-Pick Pocketers. Each sleeve slot is protected with RFID blocking materials and securely holds 1-3 cards. Minimal - With its slim no fold design, your wallet stays slim while still carrying a decent load of essential cards. The Scout reduces bulk and keeps your pockets from being less bulky and lumpy. Carry in your front pocket or back pocket. Measures 4" x 3 1/4" x 1/8"
Bellroy have made a name for themselves by creating some of the most effective slim wallets available. The card sleeve is one of their most minimal designs, small and discreet enough to fit into any pocket. The leather is high quality and environmentally certified – it’s designed to last and improve with age. Five sleek and elegant colors are available, each one oozes with style and sophistication. The main pocket can hold two to eight cards which are retrievable via the pull-tab to prevent the materials being stretched. There is an extra external slot ideal for ID for dollar bills. Bellroy is confident in the quality of their materials and craftsmanship and back this up with a three-year guarantee. The card sleeve wallet could be ideal to use as a second wallet to hold some of your additional cards. If you’re thinking of downsizing your traditional wallet and don’t need to carry many essential items, this could be a really good option for you. Minimalist wallets are growing in popularity due to the emergence of new technologies. As a society we carry less cash than before, and the efficiency of consolidating bank accounts means we carry fewer cards. Our requirements for a quality card holder have shifted from great capacity to a slim design with integrated data protection. This means we get to invest in elegant, stylish wallets that epitomize cool. 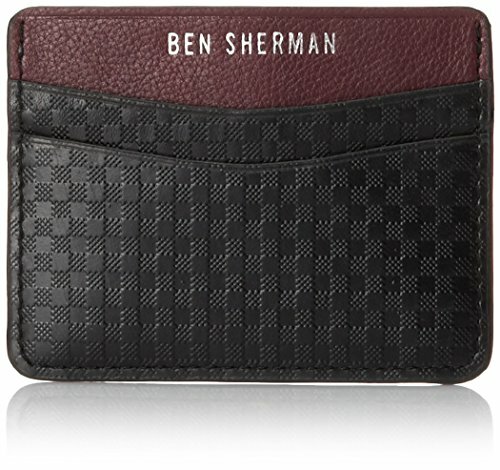 All the wallets for men mentioned in the article offer something unique or an innovative feature, but which one does the best job overall? After considering the design, quality of materials and craft, capacity, and general value, we have to say the Chelsea slim wallet by Vaultskin was our favorite. The leather is of a high quality and looks and feels great. The design and construction is ergonomic and concise, and the traditional aesthetics stand out. All six of the colors available are classic and elegant, and there is minimal detail on the wallet’s exterior. The capacity is great for such a slim wallet – up to ten cards plus some cash should be plenty this day and age. The addition of the smart strap to access your cards is great and it prevents stretching and damage to the wallet. All this plus RFID protection means the Chelsea is a practical, stylish, and forward thinking minimalist wallet. Do you agree with our choice? We hope we’ve given you enough information to make an informed decision on a wallet that is perfect for you. At the very least, we hope we have given you food for thought for what to look out for in future.